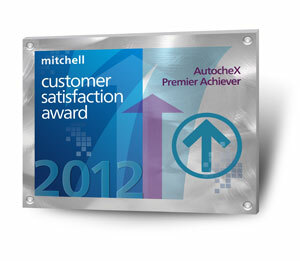 Mitchell is proud to sponsor the annual AutocheX Premier Achiever Award program to recognize collision repair facilities that achieve extraordinary customer satisfaction ratings. The award reflects Mitchell's commitment not only to measuring customer satisfaction fairly and accurately, but to promoting a genuine spirit of customer service in our industry. The honor brings recipients industry recognition that sets their organization apart from their competition. The class of 2012 Premier Achievers includes top-performing collision repair facilities of all sizes, from small, family-run businesses to large consolidators, and represents 41 states across the U.S, as well as British Columbia, Canada. In an industry of nearly 50,000 shops in North America, qualifying as one of the 400 Premier Achiever Award recipients places the collision shop winners in highly exclusive company. This Premier Achiever Award was presented to the Top British Columbia's Collision Repair Shops at ICBC May 28, 2013 with a formal presentation and recognition of this accomplishment.